And so began the journey to share information I had collected in my travels, and my spiritual search to discover who I was and the meaning of life on Planet Earth. 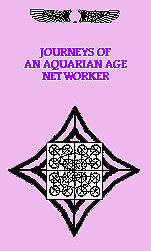 Above, is a reprint of the title page of my first book, "Journeys of an Aquarian Age Networker", self-published in 1982. This book contained information I had collected in my travels between Chicago and California from 1980-1982. Most of these travels were done on complete faith and it was indeed a time of great revelation as many people began to look deep inside -- to discover the inner spirituality and what was the New Age or Aquarian Age all about. Although some of the material contained in this book may be a bit out of date, I still felt many of my early guiding principles and the knowledge I gained on my travels have value today. Because in the early 1980's I feel is when the New Age movement began to receive some public recognition, so this information may give the readers some early insights into information that was important at that time which is still guiding and influencing us today. Especially the concept of Networking, the tool used to gather this information. Now with our International Computer Networks, such as Internet, people are able to connect and link with each other so quickly. Information about events happening in our world, especially related to the transformation of our planet as has been prophecised is flowing out and being shared over the entire planet. So in this section of pages, you will find portions of this book which I think still have value related to events today. Finally, with the acquisition for our organization of a scanner, I can make an electronic version available. The most valuable lesson learned on this Journey was getting better acquainted with the inner being, having to depend completely on using my inner awareness to sort through a termendous amount of information and try to weave together the pieces that made the most sense and at the same time gave some explanation and understanding of the changes we were feeling at that time and which has excelerated a thousand fold today. So dear readers, it is my great joy and pleasure to continue to share with you some of my early experiences and insights as well as information from other sources that have guided me along the path of Life. Sit back .... find a comfortable chair and perhaps, a few grains of insight gained in this time, may aid you on your own journey! article on the relation between them. Last Modified 05/05/2008 by ILLLINOIS.